Territorial song from scrubby, hawthorn hedgerow in mixed pastoral and arable (barley) farmland. The course of an old railway line between Knockentiber and Springside in Ayrshire provides some good scrubby habitat for Yellowhammers (Emberiza citrinella). While surveying the territorial males there last May, I heard one bird that was singing two song types which were alternated almost one after the other. Most of the birds in this area sing about eight strophes (or deliveries) per minute and stick to one song type for quite long periods, though occasionally dropping the final �cheese� phrase. 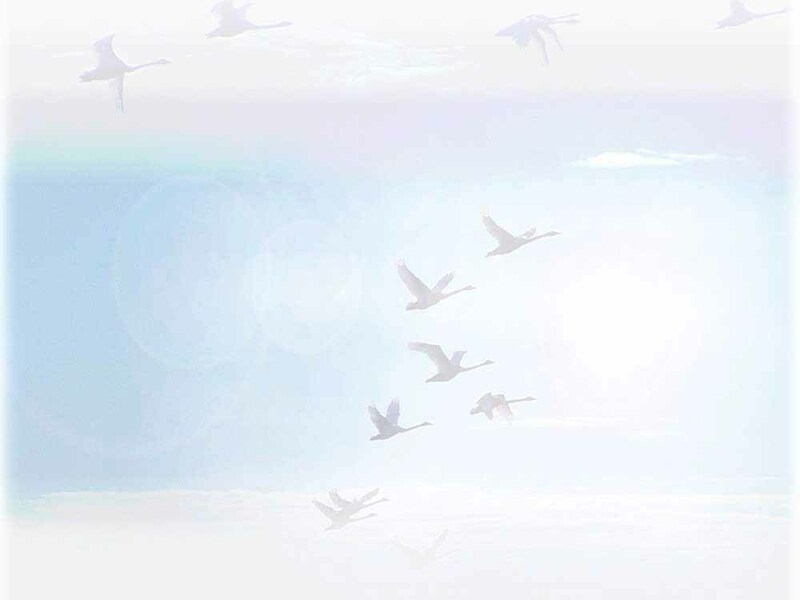 Listen to this excerpt of a recording below of this bird and you�ll see what I mean. The first strophe I�ve termed the �Fast High� song type/strophe and the second, the �Slow Low� song type/strophe. 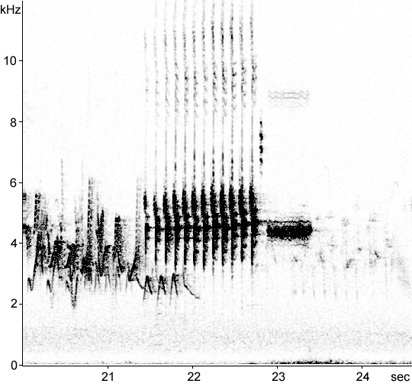 See the two sonograms below illustrating this. 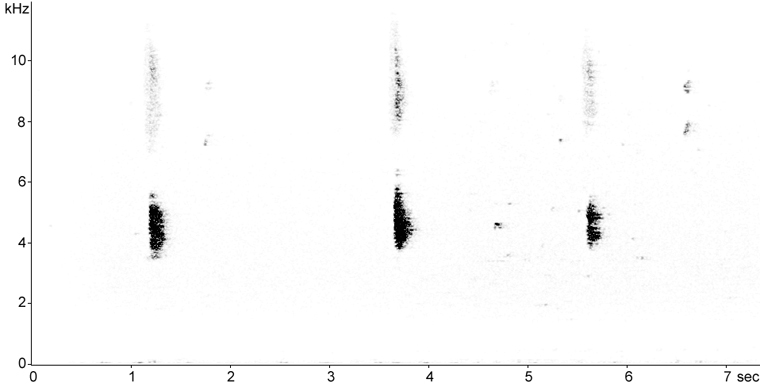 Another element in the song that is quite difficult to detect in the field with the human ear (and while listening to playback of recordings) is the very short (0.04 secs) and high pitched (up to 8 kHz) element that immediately proceeds the trill/rattle. 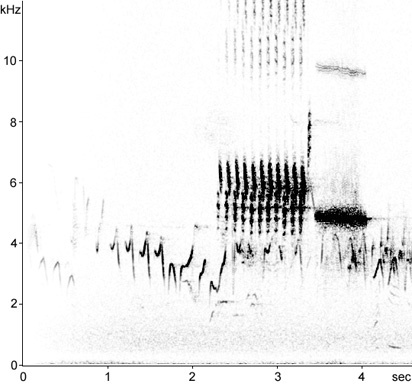 Its visible on the sonogram but see if you can pick it out in the recording. The �Fast High� strophe is around 1.84 seconds with the first phrase comprised of a trill/rattle of 10-11 syllables spanning 4.22-6.76 kHz and lasting 1.07 secs. 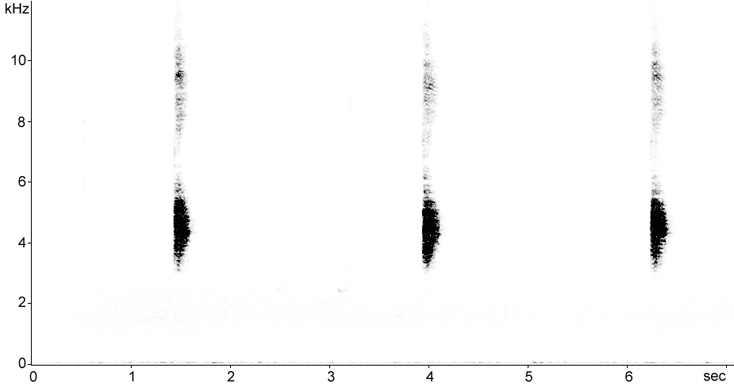 The second phrase � just a single element, and the familiar �cheese� of the popular British mnemonic for this species � is around 4.85 kHz and lasting 0.68 secs. (Willow Warbler in the background). The �Slow Low� strophe is longer at around 2.11 seconds with usually 12 lower-pitched syllables spanning 3.07-5.04 kHz and lasting 1.37 secs. The cheese phrase is also lower pitched at 4.4 kHz, lasting 0.55 sec. (Willow Warbler in the background). Two song types from one male. 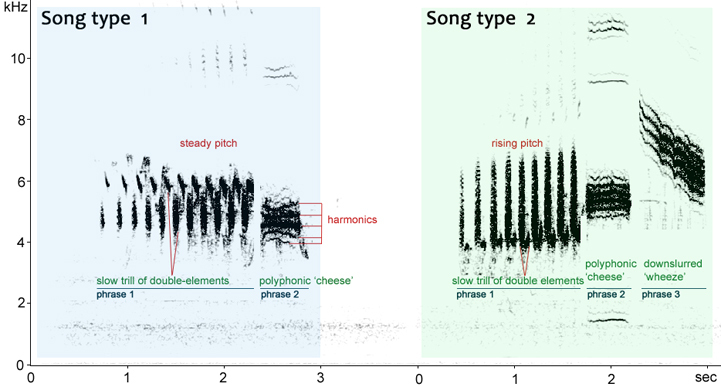 Singing bird produced 12-15 strophes on one song type before switching to the second song type, and repeating. Calls from a male in overgrown scrubby hawthorn. Calls from overgrown scrubby hawthorn, willow and elder. 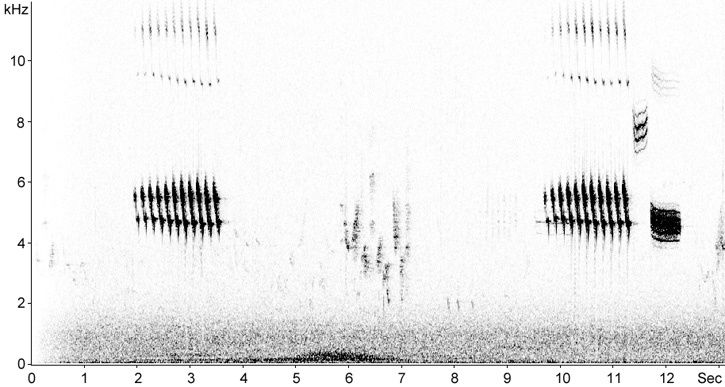 Territorial song; this bird regularly followed the usual delivery with an additional, more rarely heard high-pitched 'tseee' note rising to 9.1 kHz. Territorial song from lone oak in hedgerow bordering wheat fields.